Well, we certainly do end up talking a lot about families, don’t we? The story of the rarely-discussed yet just-as-essential English teacher at Juban Junior High School is actually pretty interesting, when you realize all the thought that Ms. Takeuchi put into her. 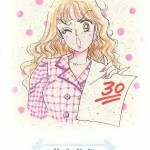 Though we don’t really know a lot about her life in general, we do know that in addition to being one of the few recurring non-main-cast characters which has been consistent across all of the various iterations of Sailor Moon,1 we also know that she and her sisters all seem to be pulled into all sorts of super natural drama. Before we go any further, though, we should touch on her name briefly. Her last name, Sakurada (桜田), essentially means field (田) of cherry blossoms (桜) and her first name, Haruna (春菜), means spring (春) greenery/vegetables (菜). It’s not incredibly uncommon knowledge that there is a character in the Sailor V manga which bears a striking similarity to Haruna—the go-get-’em Superintendent-General of the Tokyo Metropolitan Police, Natsuna (夏菜) Sakurada (桜田). The kanji for Natsuna means summer (夏) greenery/vegetables (菜). It’s been theorized by fans for a long time that there’s quite possibly a familial relationship between Haruna and Natsuna since they not only share the same last name, but live in the same part of Tokyo. Many have claimed that it’s been officially stated by Ms. Takeuchi2 that Natsuna is Haruna’s younger sister. It’s a bit hard to believe that the (young-looking) Haruna’s younger sister is in fact that Superintendent General of the Tokyo Metropolitan Police, but all the stories seem to be consistent in this regard (and there’s a further reason for believing this, which we’ll touch on a bit later). Read also: How Was Mamoru Affected by His Amnesia? 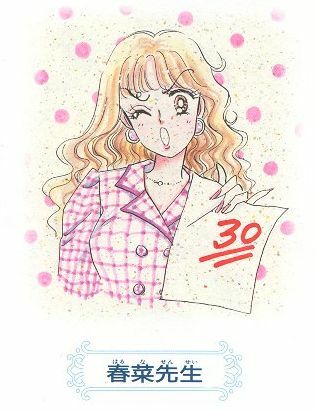 What is slightly less well known is that Sailor Moon is not the first time Ms. Takeuchi had used the character of Haruna. 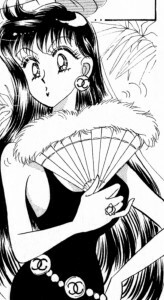 Her first appearance was in the manga Cherry Project, which was serialized in Nakayoshi magazine from October 1990 through December 1991. Much like with Sailor Moon, Haruna serves as the Chieri’s (the protagonist) homeroom teacher. Wanting to help teach the young and upcoming ice skater a sense of peace, balance, and simplicity in movement, Haruna gives Chieri a ticket to a live performance of Tchaikovsky’s Swan Lake. It is later revealed that the star of the ballet is her younger sister, Fuyuna (冬菜) Sakurada (桜田). 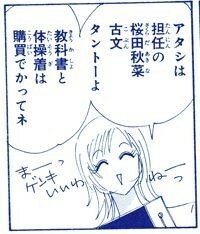 As with the other two, her name means winter (冬) greenery/vegetables (菜). Last but not least, we get the fourth in the line of the Sakurada girls, Akina (秋菜) and, as with the rest, her name means autumn (秋) greenery/vegetables (菜). She exists in the PQ Angels universe, which was carried in Nakayoshi in 1997, and plays the role of their homeroom teacher and also teaches classical literature at Koganemushi Academy. Though it’s never stated that she’s related to Haruna (in fact, unlike in the rest of the universes created by Ms. Takeuchi, it seems pretty unlikely that this series exists within the same timeline as the shared universe of Sailor V, Sailor Moon, and Cherry Project), they do share the same last name and also the occupation as a junior high school teacher. Though we can’t say with 100% certainty that they’re all related, we do know that Haruna and Fuyuna are at least sisters, and that Natsuna is also likely Haruna’s younger sister. Between a police chief, professional ballet dancer, and two public school teachers, the Sakurada’s are a pretty ambitious family, it seems! As for why it may be possible that Natsuna actually is Haruna’s younger sister, I would say the best assumption is found in their names—all four girls are named after the four seasons. Though it’s nothing more than a theory, it’s possible that the girls were named in the order that they were born: Spring (Haruna), Summer (Natsuna), Autumn (Akina), and Winter (Fuyuna). Not absolute proof, of course, but in a series where Ms. Takeuchi has thought so much about names and birthdates, it is definitely possible! Read also: Why Is Minako Bad at Japanese? ← What is the Story Behind Nephrite’s Alter Ego? PQ Angels can still be part of the shared universe, just have Queen Anko also be Sailor Furien.